There was no picture accompanying this stitch pattern, so I was very pleasantly surprised after I had finished the first repeat of it! This is one of the prettiest stitches I think I have ever seen! And it is easy to remember too even though it is a 12 Row repeat. I found this gem of an edging in the NY Daily Tribune for February 29, 1880. It was submitted by a Mrs. T. H. Corbett. You will be making a double yarn over on several of the rows; on the following row, you will be working both of these yarn overs - the first is knit, and the second is always purled. Here is a sample I knit on Size 10 Crochet thread with US Size 0 needles. It is hard to tell in the picture, but obviously the stitches are much smaller with the lighter cotton thread and smaller needles. It makes a more dainty piece of fabric. You will see the difference in the video. 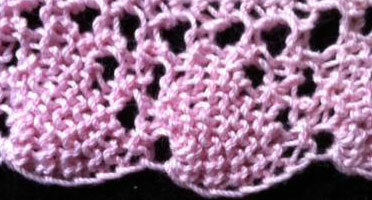 And here is a video of the Shell Lace Edging. Happy Knitting, and Enjoy! I have been a long time fan of the Cobweb Frill, however have been too scared to even test it out, let alone use it on a project. Until now. I suppose I've been afraid because dropping stitches is involved. As a knitter, most of the time we do everything we can to keep from dropping stitches. Panic normally ensues when a stitch is dropped, and even worse if that stitch should start to unravel! It is hard to convince ourselves it is ok to intentionally drop stitches, and let them unravel clear back to the cast on edge. But fear no more! This is a beautiful thing, so go ahead and drop those stitches! Repeat the above two rows until frill is the desired length. Be sure to end on Row 2. Repeat these two rows twice more. Unravel the dropped stitches do the cast on edge. 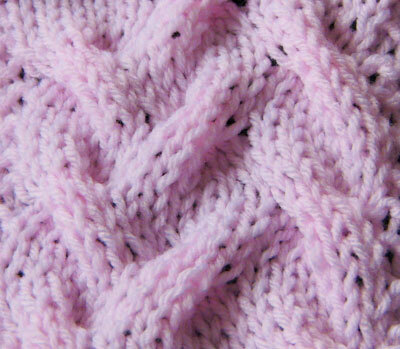 If you plan to sew the frill onto an already completed piece, then bind off at this point. Or, you may simply continue on to knitting your main pattern. Do keep in mind that 1/3 of the stitches are going to be dropped, so you will need to make sure you account for those stitches when casting on, if you are going to go straight into your main pattern. If you are comfortable with dropping stitches, you may want to check out Clapotis, by Kate Gilbert. This fabulous scarf appeared in the Fall 2004 issue of Knitty. 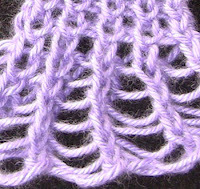 I usually don't do cable stitches, because they tend to be more involved than other stitch patterns. However, this particular stitch pattern was requested by someone who saw it in my blanket in the "Oops" video. So, here it is! 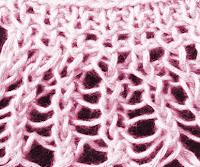 To Cable Front: Slip next 3 stitches to cable needle, and hold in front of the work. Knit 3 from left needle, then knit the 3 from cable needle. To Cable Back, slip next 3 stitches to cable needle, and hold in back of the work. Knit 3 from left needle, then knit the 3 from cable needle. Here is a video - I only show Row 3 and Row 7 where the cables are worked, to save time. Happy Knitting!